Reduce, reuse, recycle. Most of us know that slogan but if I was any indication, it’s a case of RECYCLE, Reuse, reduce rather than REDUCE, Reuse, Recycle, mainly because it’s easier and doesn’t take any real effort. 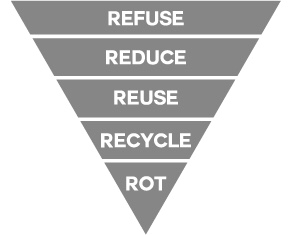 The zero waste talk I went to last July talked about Bea Johnson’s 5Rs which expands on the reduce reuse recycle (some people have expanded it to 7Rs or more but they seem overly complicated to me so I’ll stick to 5). The idea is that the more of the things at the top you do, the less of each of the lower ones you need to do. Bea Johnson is almost completely waste free so landfill doesn’t get a mention. Maybe I was already starting to think this way but it suddenly clicked that the reduce was way more important that the recycle and that key to that was to refuse to buy things I don’t need and refuse the plastic packaging that comes with the things I do need. Recycling is almost a last resort. Once I starting thinking that way I started seeing the world differently. The talk went on to discuss the impact of plastic on the ocean, the fact that most plastics are not recycled in NZ and also the high energy cost of recycling and transporting overseas. When you read about the types of plastic it gets quite scary. I did not know they use PVC on meat or that you shouldn’t reuse plastic water bottles (type 1). To be honest, it was probably easier not to know. And food packaging cannot contain any recycled plastic content. And that’s an awful lot of plastic. In September, at work, we did a week where we asked people not to use disposable plastic. Our bins went from two overflowing bins every day to barely a quarter of one full. A huge difference over 5 days. At home, now I’ve started refusing plastic, I’ve noticed my cupboards are emptying out. 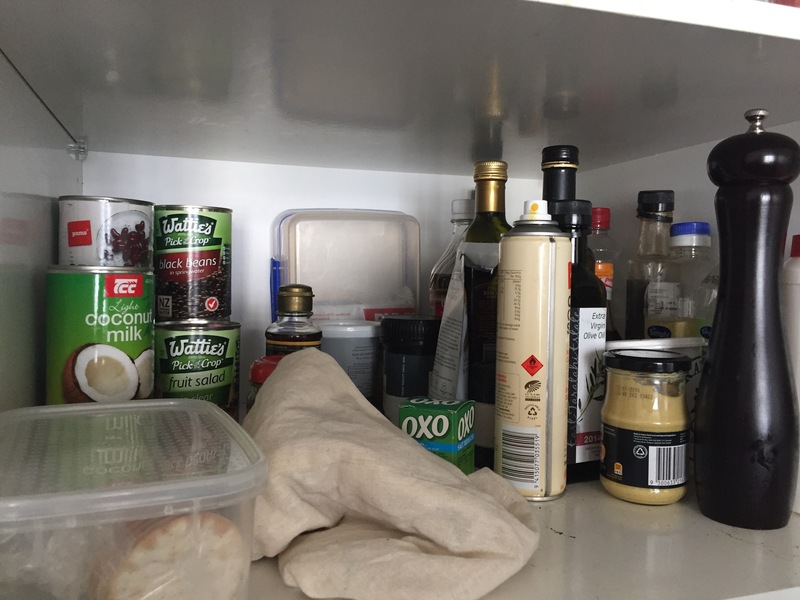 Where once there was a jumble of tins, bottles and containers, there is now increasingly empty space. Cans are being replaced with dried goods in stackable containers, tinned tomatoes with fresh and empty vinegar and oil bottles are being refilled rather than buying new. I no longer have a nearly empty bottle and a new one jostling for space. And yes, I’m discovering things tucked at the back that I’d forgotten about – like the three bottles of Olive oil from a friend’s own olive grove. (Yes, you can grow olives and grape vines just an hour outside Wellington in the Wairarapa) I emptied the store bought bottle but hadn’t touched these !?!? 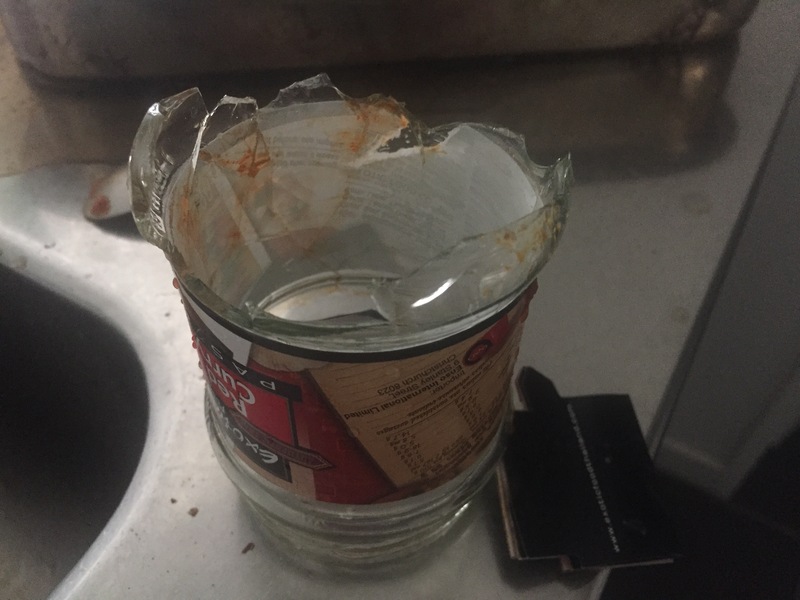 There was also an unintentional clearance when I knocked a glass jar out of the cupboard. 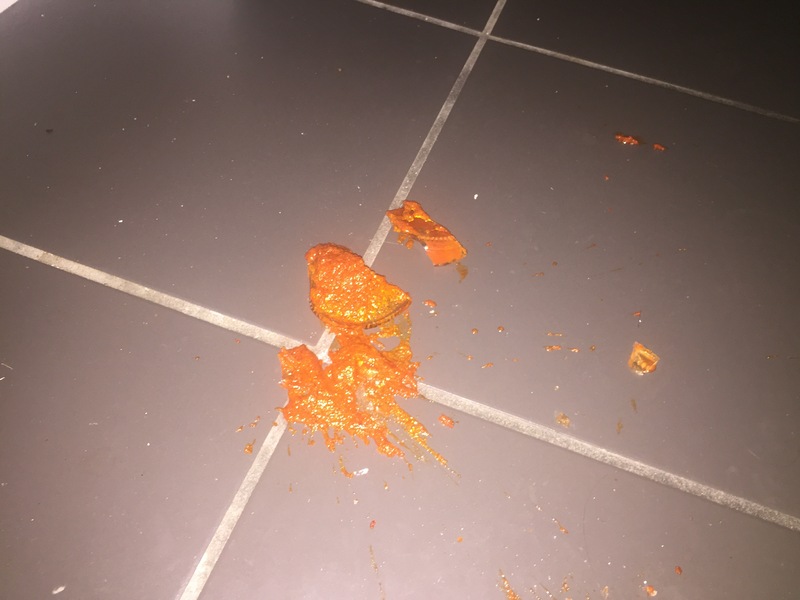 That’s the biggest downside of glass jars. Where I can I’m reusing my containers. 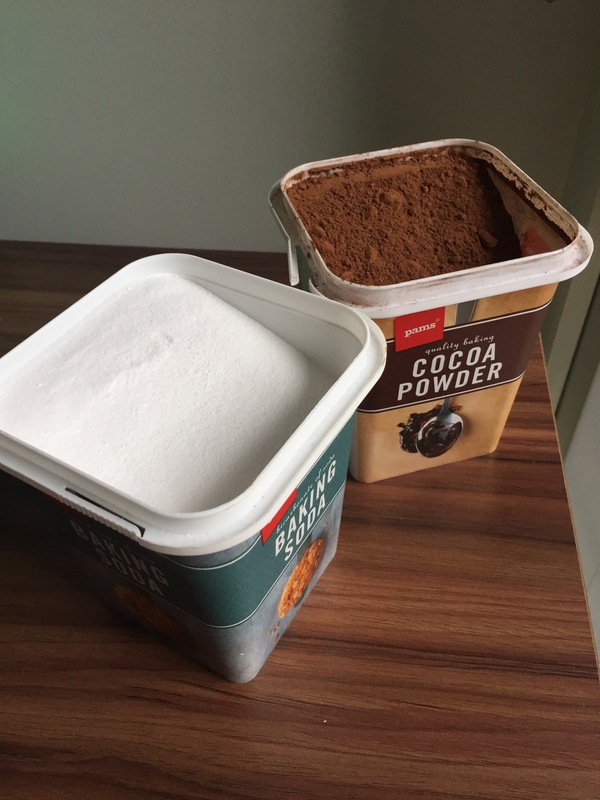 I refilled my baking soda and cocoa powder containers yesterday at Moshims Foodmarket Baking soda worked out more expensive to buy in bulk than a new container ($2.58 for 500g versus $1.95 with container), but the cocoa powder was slightly cheaper ($3.25 for 250g versus $3.69 in a container). It doesn’t look quite as dark so I hope it will be as good in baking. Working out how to tare the containers caused a bit of head scratching for the shop assistant, who suggested I go fill some plastic bags and bring them back to the counter and he would throw them away, but we got there in the end. 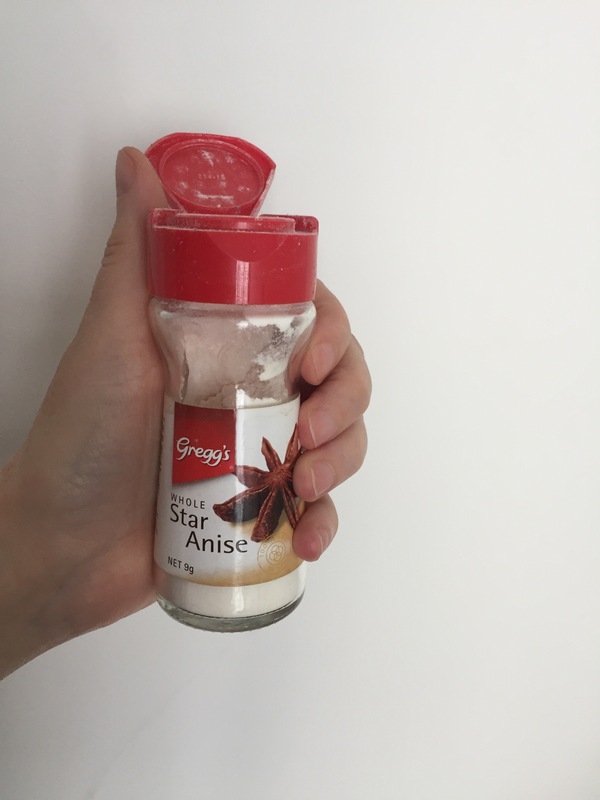 I’ve also discovered my old spices jars make great shakers for baking soda which helps when using for cleaning – either sprinkling on the carpet before vacuuming or for bathroom cleaning. Where once I would have had a collection of plastic shopping bags, I now seem to be accumulating brown paper bags for reuse. I used one today to buy some chocolate coated almonds in New World. The guy at the checkout said it was the first time he’d ever seen someone using an alternative to the plastic bags but he was very impressed and congratulated me when I explained. He did pack them into a plastic shopping bag as we were talking but that was easily remedied. With all these little changes, my recyling is pretty minimal. There’s still some cans and container bought pre Christmas, but most of my recyling is things like the cardboard innards of toilet rolls or paper packaging. I’d say I’ve reduced my recycling by at least 75%. For me refusing rather that recycling is the obvious way to go to make an impact on our waste problems. Next Post News news news!